Sign in to Microsoft 365 Business admin center with global admin credentials. 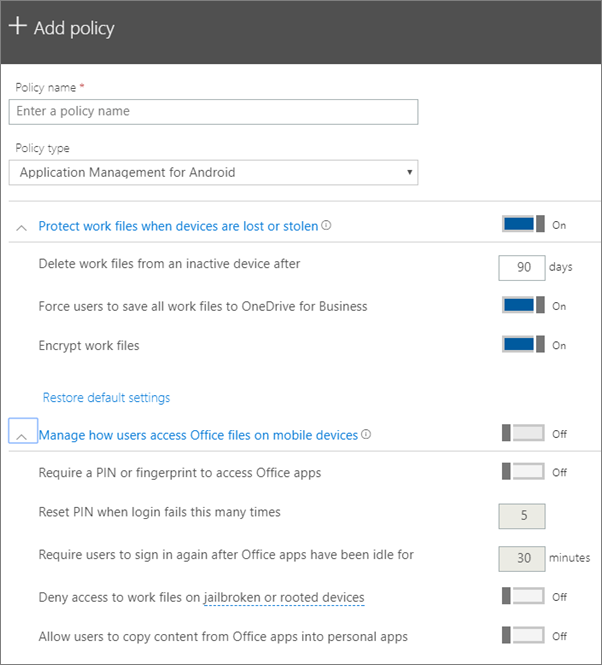 In the admin center, choose Devices > Policies > Add policy. On the Add policy pane, enter a unique name for this policy. Under Policy type, choose Application Management for Android or Application Management for iOS depending on which set of policies you want to create. Expand Protect work files when devices are lost or stolen and Manage how users access Office files on mobile devices > configure the settings how you would like. The Manage how users access Office files on mobile devices is Off by default, but it is recommended that you turn it On and accept the default values. See Available settings for more information. You can always use the Reset default settings link to return to the default setting. Next decide Who will get these settings? If you don't want to use the default All Users security group, choose Change, choose the security groups who will get these settings > Select. Finally, choose Done to save the policy, and assign it to devices. On the Policies card, choose Edit policy. When you are finished, close the Edit policy pane. On the Policies card, choose Delete policy. On the Delete policy pane, choose the policies you want to delete > Select, then Confirm to delete the policy or policies you chose. The following tables give detailed information about the available settings to protect work files on devices and the settings that control how users access Office files from their mobile devices. See How do protection features in Microsoft 365 Business map to Intune settings for more information. If a device is not used for the number of days that you specify here, any work files stored on the device will automatically be deleted. If this setting is On, the only available save location for work files will be OneDrive for Business. Keep this setting On so that work files are protected by encryption. Even if the device is lost or stolen, no one will be able to read your company data. If this settings is On users have to provide another form of authentication, in addition to their username and password, before they can use Office apps on their mobile device. To prevent an unauthorized user from randomly guessing a PIN, the PIN will reset after the number of wrong entries that you specify. This setting determines how long a user can be idle before they are prompted to sign in again. Clever users may have a device that is jailbroken or rooted. This means that the user can modify the operating system, which can make the device more subject to malware. These devices are blocked when this setting is On. We do allow this by default, but if the setting is On, the user could copy information in a work file to a personal file. If the setting is Off, the user will be unable to copy information from a work account into a personal app or personal account.